Trump Punks’ Standing Up to Fall. Photo by Ted Friedman. 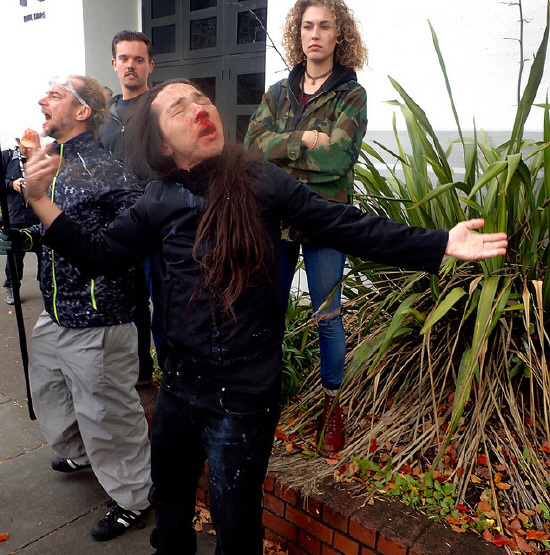 Why TrumpPunks have to do it in Berkeley may surprise you. 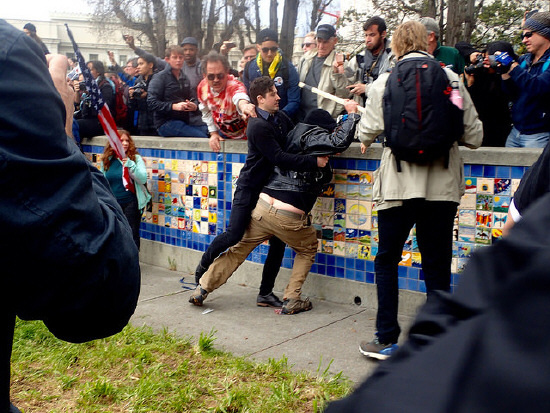 Trumpunks are Trump supporters with balls big enough to demonstrate in the very bowels of lefty Berkeley, like say, Berkeley Civic Center Park. Civic Center is Berkeley’s core, nestled between old and new city halls, and host to a 1980s peace-wall, a 175 ft. long wall comprised of more than 5,000 hand-painted tiles, each with a plea for peace. Peace Wall. Photo by Ted Friedman. The Trumpsters came for media attention…perhaps ready to be trounced. 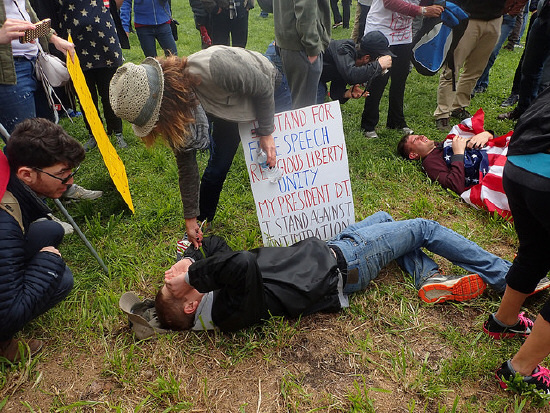 Some of them wrestled away the posters of anti-Trumpsters to protect themselves, while others just sucked up the attacks. Some seemed to flaunt their battle wounds, like blood-red badges of courage. Red Badge of Courage. Photo by Ted Friedman. All manner of photographers, and reporters from Bay Area media swelled the crowds at last month’s beat-down in civic center. All the better for TrumPunks to shame Berkeley into accepting them, at least as wackos, in a town of wackos. It just may have worked. As police kept watch, the Trumpsters were beaten with their own signs, maced, pelted, with eggs and lighted cigarette butts, and smoke-bombed. 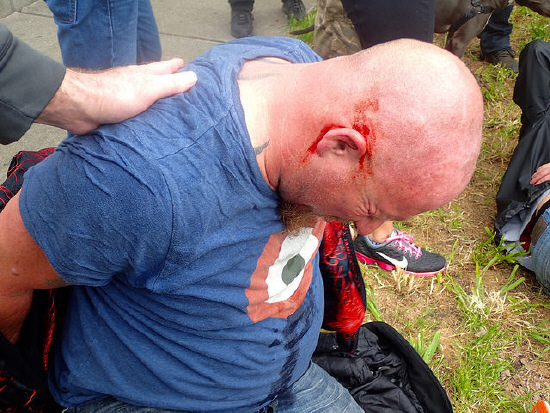 There were ten arrests of Black-bloq style masked marauders from around Northern California. This at a time when arrests in such protests declined, as police around the country stood down. 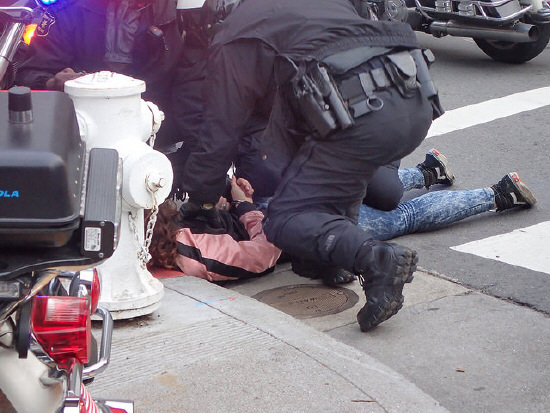 The arrests were cleverly conceived to pluck-out the worst outside agitators, some say provocateurs, as they arrived—by bus or rapid transit—and as they tried, later, to escape police cordons. A re-staging of this force counter-force melee will play out later this month. Same plot; same characters; same peace wall. 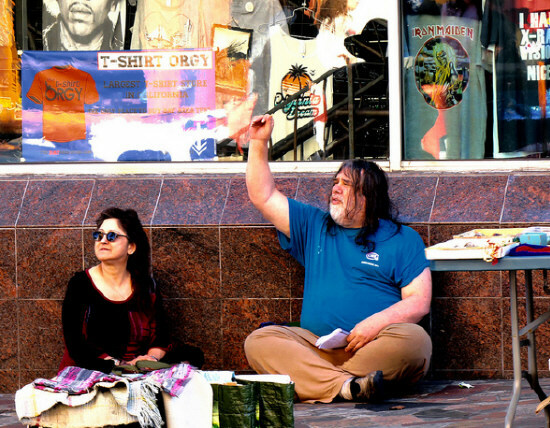 This piece is dedicated to the memory of Mark Hawthorne, Berkeley’s beloved SouthSide homeless hero (aka Hate Man), and former New York Times reporter, who tried to improve my reporting. Cal Berkeley offers a Phd. in Rhetoric ruled by some of the best rhetors on the planet. 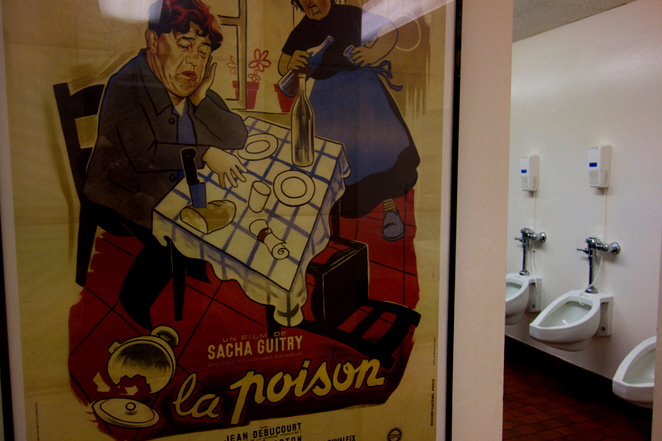 In the coffee houses of Berkeley the learned and the unlearned…use/misuse rhetorical strategies between espressos. You could say that the intellectual force of Cal had trickled down to the rest of us. You just don’t expect to hear blatant, unabashed rhetoric in, what, ultimately, was a mental health case on the streets. The entire incident was witnessed by a crowd of angry street-people/urban survivalists…and they became more and more agitated as events played out. By the time you read this in the papers, one of Berkeley’s links to the turbulent ’60s will be dead. Death came, peacefully, with the dying Med surrounded by close family and friends. Medheads, who died before they had to say goodbye to their beloved hangout. Founded in 1956 (for a year as the Piccolo), the Med was both a witness to its times and a participant. The Black Panthers regularly met in the mezzanine office of the Med owners. A lot of tear gas has gone down over the years, and recently during a demo two years ago, which mimicked the 1969 People’s Park riots on Telegraph Avenue. People’s Park organizers considered the Med their headquarters, as did the Free Speech Movement. You are perhaps more likely to be mugged or murdered on the Berkeley Southside street where I live than in Berkeley’s serene Elmwood District, which is a mere hop-skip-and-a-jump away. In the Elmwood, neighbors posting on a neighborhood website tout, “enjoy the Berkeley lifestyle.” This might include a stint cat-sitting in a mansion, being a nanny, household cook, computer coach, or Koi-pond-tender. You might score a free photo album, bird house, baby bath-tub,storage closet, law books, keyboards, moving boxes, guinea-pig cage, or a Blue-Nose Pit Bull. In my neighborhood, we sift through detritus dumped on our neighborhood streets, and if we find a bauble or two, we proclaim it street-score. 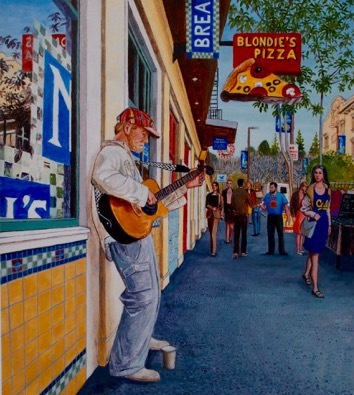 Telegraph Avenue street artist Ed Monroe’s hand-to-mouth life-style took a paste to the mouth recently when he lost free pizza for life at Berkeley’s Blondie’s Pizza. Blondie’s was sold recently to a longtime employee. Blondie’s was the 1960s (“Make Pizza Not War!”) love-child of the nine store Rasputin music chain and other enterprises of Berkeley’s titan of Telegraph trade—Ken Sarachan. 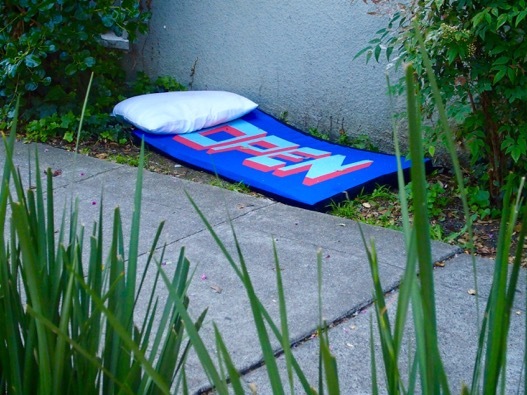 A lot of bedrolls have been unfurled since “Is Berkeley a Hilton to the Homeless?” appeared in the Berkeley Daily Planet five years ago. 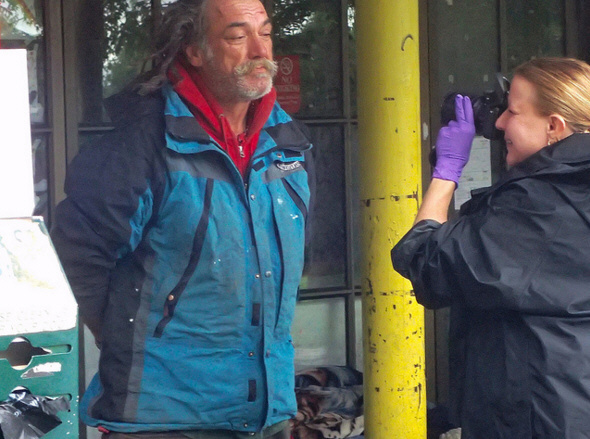 That piece, somewhat tongue-in-cheek, suggested that Berkeley was an oasis of homeless services and compassion. Home-run head-dent averted. Photo by Ted Friedman. The sentence “Southside perps get royal treatment” needs some treatment itself. Perps is a cheap shot, and royal treatment an exaggeration. Two recent Southside incidents make my case. 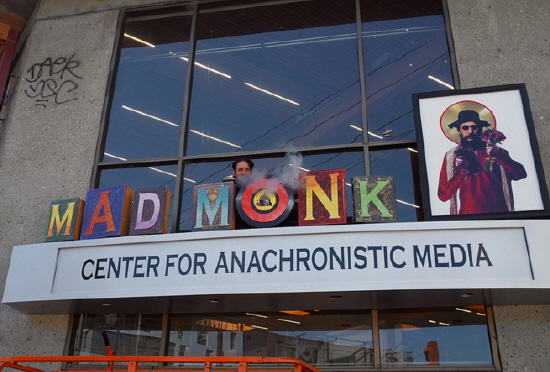 New sign blows smoke. Photo by Ted Friedman. Cody’s Books is sort-of-back, after a nearly twenty year Rip-Van-Winkle. Cody’s Books, deceased 2008, has stood empty ever since–a big chunk of a blighted block at Telegraph/Haste. 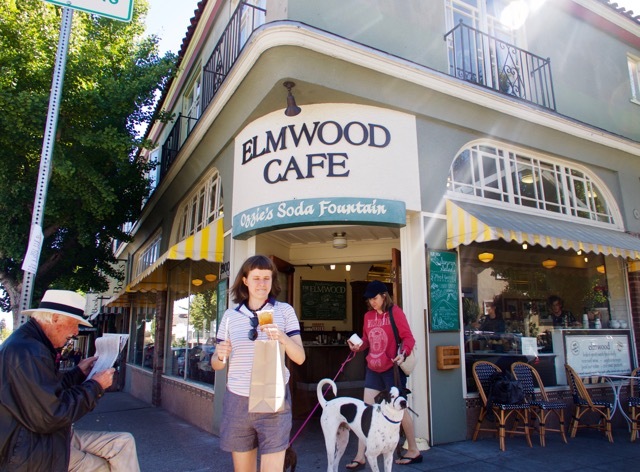 With nearby Moe’s Books, and the Caffe Mediterraneum, Cody’s formed an historic triangle harking back to Berkeley in the fifties. The Bally-hooed book and author-talks center could re-open (softly) by week’s end, as a used books and records store. Whether the opening is timely depends on what the Cody Building owner Ken Sarachan’s staff call’s ‘Ken time,’ a timing system of starts,stops, and reversals. “I can do something Ken wanted only to have him change it,” says a staffer. Former Berkeley Art Museum. Photo by Ted Friedman. Let’s say you’re Southside, seeking restrooms. Yelp is no help. We have held off our restroom recommendations for decades, not wanting to cause a stampede at our favorite piss destination.